If you weren't sure if you were going to pre-order Resident Evil 7 just yet as you were waiting to find out what the bonuses could be then you might be in luck here. A while back there was news from Capcom that we'd be getting a few extra "episodes" for the game and some Survivor Packs to help us through the game as well as beat the hardest difficulty of the game from the very start of it all. 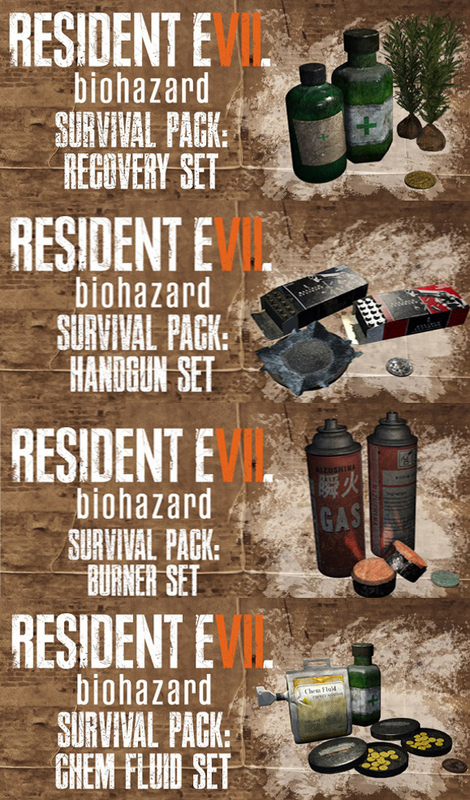 Of course as that was still back when Resident Evil 7 had just become a thing, they were very loose on what the items in the Survivor's Pack could be. Now we fast forward a little bit to now and it looks like a Swedish retailer might have let the cat out of the bag. At least if you want to believe the following images that have been pulled right from their site where you can pre-order Resident Evil 7. As it looks, we will be getting a whole bunch of items for both the offensive and defensive style of play with the pre-order of the game. Green Herb, Ammo, Health Spray, and other items to fight off the enemies look to be included here. There are no quantities listed but I'm guessing that it will be way more than needed for a survival horror title. To recap on the other items mentioned a while ago for those who pre-order Resident Evil 7, it looks like there will also be four more mini-episodes in the vein of the current demo that can be played for the game. Something small and to keep the horror flowing for a few more hours but something none the less. Also there sounds like there will also be a whole other episode for the core game mixed in as well. Why this would be a pre-order bonus thing only is beyond me but since it hasn't been fully details out just yet it could shift over to something else. Hopefully not paid DLC as that would feel like Capcom wasn't giving us a full game from the start. Do these items make you want to pre-order Resident Evil 7 any more or are you still going to hold out? Do you think the quantities of these items will be rather large or just a few extra so the core gameplay is left intact? Do you think this could just be some early information that doesn't actually pan out further than all of us posting about it? Let us know and feel free to discuss in the comments below. For all things Resident Evil 7 be sure to stay right here as we'll keep pumping it all out there for you as we dig it all up.